Many questions are being asked about the impacts that the remnants of Hurricane Isaac will have on Mid-South weather as we head into a holiday weekend with plenty of outdoor activities planned. 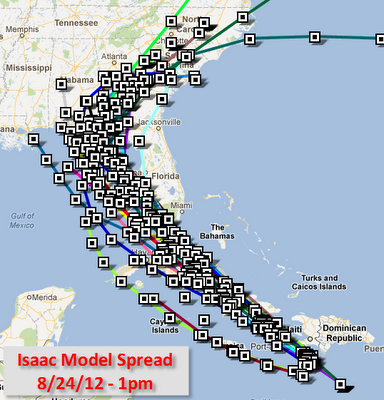 The forecast track of Isaac's leftovers are shown below. As the storm exits Louisiana this evening, it will move north across west-central AR into southwest Missouri by Friday night. This places the entire Mid-South in the favorable region for showers and thunderstorms and the possibility of a few severe storms on Friday. Forecast track of what's left of Isaac. 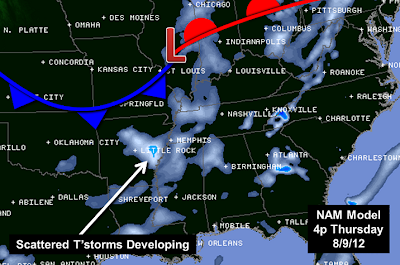 The Mid-South will be in a favorable region for showers and storms Friday. The northern edge of Isaac's rain shield moved into the metro this afternoon and scattered showers are expected through the evening, tapering off after dark. (After landfall, much of the precipitation that is well-removed from the center of former tropical systems tends to wane during the evening hours and re-generate by late morning, aided by the sun's heat from above.) A few showers are still possible overnight. The main effect overnight will be continuous southeast wind at 15-30 mph. No severe weather is anticipated overnight. On Friday, showers will expand again across the region and by afternoon some bands of heavier tropical rains and embedded thunderstorms could form to the east of the center (over the Mid-South). Due to the wind shear present east of the center of the storm, some thunderstorms could produce tornadoes, thus there is a slight risk of severe weather posted for most of AR and western TN and MS in the most favorable region. A note on tornadoes associated with land-fallen tropical systems: they tend to be brief, quick spin-ups, and relatively weak by tornado standards. We're not talking major EF-4/5 tornadoes, but certainly any tornado can produce localized damage. The chances of tornadoes is LOW, but is worth mentioning. We believe the threat to be higher over east AR than east of the Mississippi River. As mentioned above, weakening of the precipitation occurs by dusk, so for Friday night, the thunderstorm threat should be very low. We'll be close enough to the center of the storm to still have a good chance of rain overnight. Wind tomorrow will be out of the south at 15-25 mph. Friday night football and the Delta Fair will have to deal with scattered showers. For Saturday, the storm moves well to our north to alleviate any severe weather concerns, however we'll be in a moist tropical-like environment that could produce scattered showers and perhaps some thunderstorms, mainly across west TN and east AR in the afternoon hours. A similar situation will unfold Sunday and labor Day Monday with a few less showers and thunderstorms each day. It will remain humid and very warm throughout the Labor Day weekend - perhaps reaching into the mid 90s by Monday again. A good chance to get in one last summer swim! Overall, the heaviest rainfall will be found to our west, where it is desperately needed to alleviate extreme drought conditions. However, 1-3" is possible in the metro area (see map below). Total forecast rainfall from Isaac through the Labor Day weekend. MWN will be closely monitoring the weather situation over the next few days and will bring you the latest via the MWN Forecast, Facebook page and Twitter feed. If you haven't already, please consider downloading our mobile app for iPhone and Android devices for the latest weather information, including StormView Radar. In the app, you will have the opportunity to add StormWatch+ severe weather alerts that will notify you if your specific location (not your county) is under a threat of severe weather. It's the fastest, most reliable way of receiving severe weather information that is pertinent to YOU. Thanks in advance for checking it out! Mid-South meteorologists have a very challenging week ahead thanks mainly to one very large unknown: the eventual forecast track of what will become Hurricane Isaac in the Gulf of Mexico. For the first half of the week, the forecast is somewhat predictable. Humidity has returned on a southerly fetch of Gulf air, creating typical summertime conditions - hot and humid with small rain chances in the afternoons. We saw that today with a high of 94 and dewpoints well into the 60s. A smattering of afternoon showers brought rain to a few folks, but not like the steady rain that many saw Saturday morning as a warm front moved through. Monday and Tuesday will see a few more afternoon showers, but likely no more than a 20% chance. Temps will reach the mid 90s for highs with lows in the 70s. A weak low pressure trough will move through late Monday, pulling wind back to a more northeasterly direction and slightly reducing humidity values on Tuesday. After a reasonably dry but hot day Wednesday, the tricky part of the forecast will be Thursday through Saturday and will be entirely based on where Isaac decides to go between now and then. Over the past 24 hours, Isaac has moved through the Florida Straits and just past the Florida Keys as a strong tropical storm. 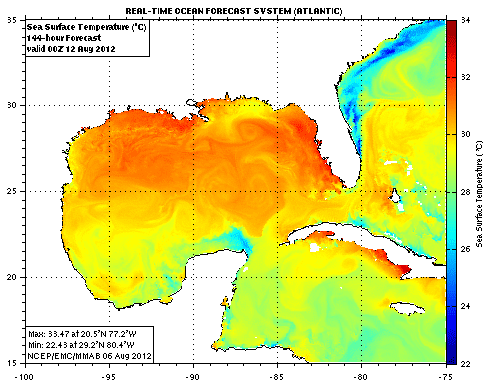 It now embarks on a trek across the very potent Gulf of Mexico. Organization of the storm this afternoon should lead to strengthening by tomorrow and with plenty of very warm water and low wind shear values ahead of it, we expect to see Hurricane Isaac tomorrow. 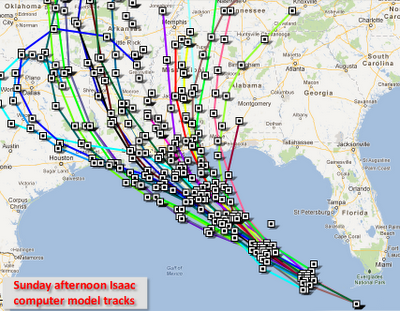 Unfortunately, computer models continue to struggle mightily with the eventual path of Isaac with landfall points ranging from the TX/LA border to the panhandle of Florida. As a whole, model tracks have generally shifted west slowly, enough that the National Hurricane Center (NHC) now has landfall early Wednesday very near the MS/LA border, or just east of New Orleans. Hurricane Warnings have been posted from Destin, FL to Morgan City, LA. The Hurricane Center's intensity forecast calls for a strong category 2 storm at landfall, with maximum wind near 100 mph. 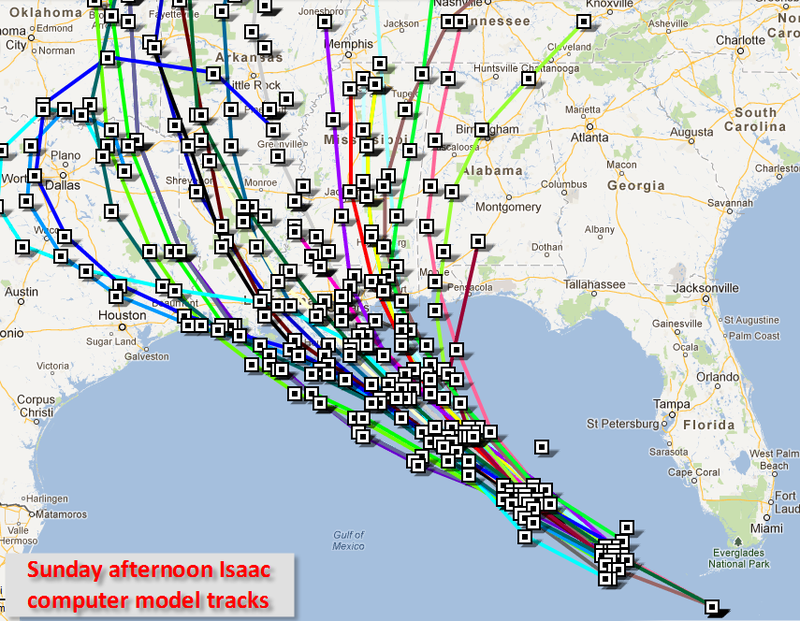 Sunday afternoon computer model forecasts for Isaac. These are NOT official forecasts, just possibilities. Being that my meteorological expertise is not truly in tropical forecasting, I am not one to go against the experts and forecast something different, however I like the latest solution that NHC has come to with regards to the forecast track. I tend to lean towards a stronger storm given the optimal conditions ahead of Isaac, however that is tempered some by it's behavior the past couple of days when I expected we'd see a little more strengthening. Computer models are tending to favor a major hurricane by landfall (category 3+), which makes a lot of sense, but NHC may be on to something. Given the NHC forecast, impacts to the central Gulf Coast region will be widespread and destructive, particularly near and to the right (east) of where the center makes landfall. In their scenario, this would especially target the Mississippi Gulf Coast. Storm surge flooding of up to 8-12 feet would be possible in this area, which would push Gulf water perhaps miles inland. In addition, torrential rainfall, some tornadoes, and prolonged 50-80 mph wind would do a great deal of damage. The Alabama Gulf Coast and western panhandle of Florida, including Mobile Bay, Gulf Shores, Pensacola, and Panama City Beach would also see a surge of water, sustained gale force wind, heavy rain, and possibly tornadoes. Flooding would be a serious threat in these areas, as well as over much of Mississippi and southern Alabama. Tropical warnings as of 4pm CDT Sunday with areas already seeing tropical storm force wind in orange. Hurricane Warnings are posted from Louisiana to Florida. In eastern Louisiana, including New Orleans, the impacts would definitely be felt, but may not necessarily be devastating if they stay on the west side of the center of the storm. On that side, wind would blow offshore and the storm surge would be minimal. Gale force wind would still be likely and torrential rain could produce some flooding concerns. HOWEVER, if the track shifts any further west, placing New Orleans under and east of the center of the storm, all bets are off and infrastructure rebuilt after Hurricane Katrina will get it's first true test. So, though we don't know exactly where landfall will be, I can all but guarantee that some places are going to feel the wrath of a mighty storm. After landfall, areas inland will deal with the remnants of Isaac. Inland effects are worse on the eastern side of the storm than the western side, with widespread heavy rain and thunderstorms, strong wind, and isolated tornadoes all possible to likely. On the west side of the storm, especially within about 100 miles of the center, breezy to windy conditions and rainfall are likely, but the tornado threat is very low. Areas outside of that radius would get a breeze, but probably not much rain. Rainfall forecast through Friday evening, given the current NHC track for Isaac. Notice the tight precipitation gradient along the Mississippi River, where west TN is forecast to receive 4-8" of rain and east AR less than 1". For now, the MWN Forecast holds off on predicting a specific outcome until there is more certainty. Though the rainfall forecast above looks ominous for west TN, this is highly subject to the track of Isaac and we're not ready to bite just yet! Many have asked about next weekend's outlook. At this point, we can hope that even if we get the remnants of Isaac, most of it will be cleared out by Saturday and Sunday. I simply make no guarantees other than we'll keep you posted if you follow along! 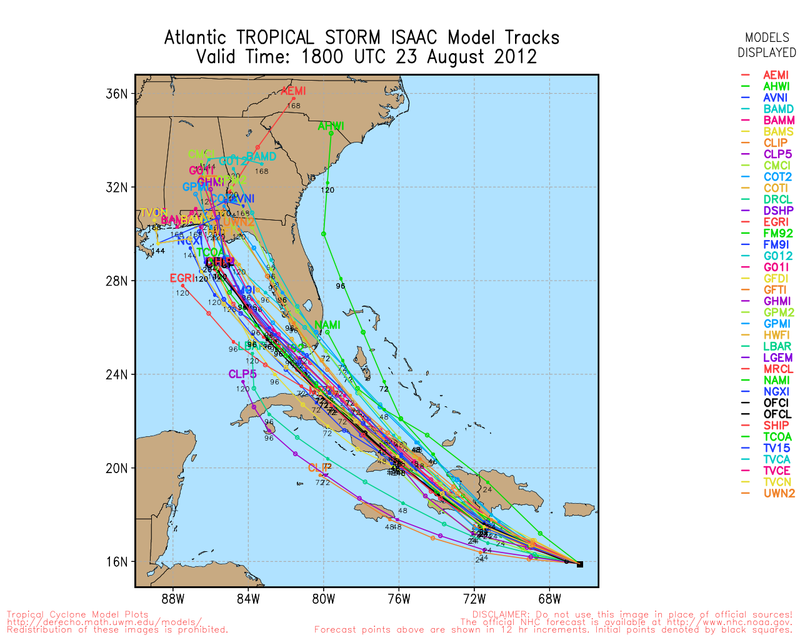 Last night, I wrote a pretty detailed blog on Tropical Storm Isaac. If you wish to review it, click here. I won't go into quite as much detail today, but there have been a couple of fairly noteworthy developments since last night. 1. 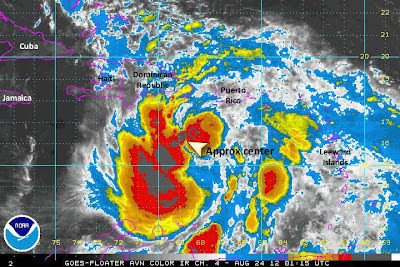 Intensity - As expected, the appearance of Isaac has improved and that has been reflected in the overall strength of the storm. As of the 4pm update from the National Hurricane Center, maximum sustained wind is up to 65 mph and minimum central pressure has dropped to 994 mb. Little additional strengthening is expected until after the storm passes Cuba. Some weakening is likely if it passes over enough land (esp. Cuba). 2. 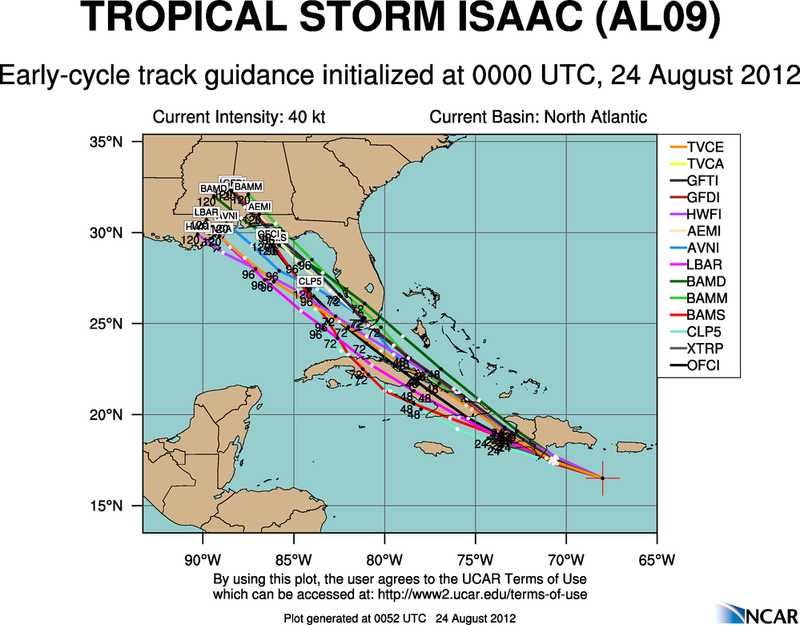 Motion - After moving generally westerly for a couple of days, Isaac made it's turn to the northwest as it moves into a weakness in the high pressure ridge it was moving to the south of previously. This sets it's course across Haiti and Cuba as it gets ready to head into generally towards south Florida this weekend. 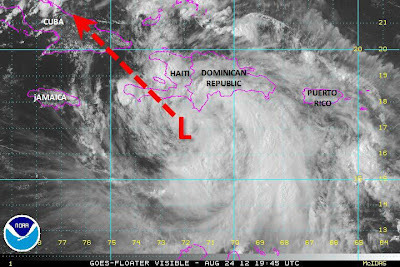 Mid-afternoon Friday visible satellite image of Isaac and it's approximate forecast path. Note the better organization of the storm than shown in yesterday's blog post. 3. 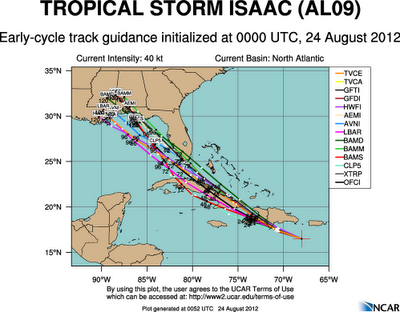 Forecast track - Watching each run of the model tracks is rather interesting. After overnight observations of the upper level pattern made by a NOAA jet were ingested into the models, the tracks stopped their incessant westward shift and have now started sliding back to the east. While the central Gulf Coast from Mobile to Apalachicola needs to continue to remain on high alert, there is now increasing worry for the Florida peninsula. In fact, the 4pm "official" track from the Hurricane Center (below) moves the forecast path nearly over Key West and on to a landfall near Pensacola on Tuesday. However the forecaster's discussion leaves open the possibility of a further eastward shift in the track of models continue to converge on that solution. Friday afternoon computer model tracks showing potential paths. All eyes are on the FL panhandle, though south Florida and the Florida Gulf Coast need to also be on high alert. 4pm CDT "official" hurricane track from NHC. Courtesy Weather Underground. Any more rightward (east) shift in the first day or so will place much of South FL in a higher risk. 4. Affects - This eastward model shift means that a much larger population is now potentially in harm's way, including (once again) Tampa and the RNC next week, as well as much of south Florida. Depending on how close the storm moves to the west coast of Florida and how much (if any) of south Florida the storm moves over, the ultimate strength of Isaac could vary greatly. As most people know, more warm water = stronger storms. A direct path across the Gulf to MS/AL/FL panhandle could bring a much stronger storm than one that crosses south Florida and skirts the west coast of the peninsula. Time will tell and many more model runs lie between now and any potential landfall. South Florida in particular needs to start preparing as Tropical Storm Watches have been issued from south of Fort Myers around the southern tip of the state to north of West Palm Beach, including all inland areas from Lake Okeechobee south. There is enough warm water between the current location and the tip of Florida (and less land area to traverse) that a hurricane-strength storm would cause major issues for places from Fort Myers to Fort Lauderdale. NHC leaves open the possibility of Hurricane Watches for south Florida with any further eastward shift in the track. We'll continue to monitor developments, provide bits of useful information on our social feeds (listed below), and update the blog as necessary and warranted. 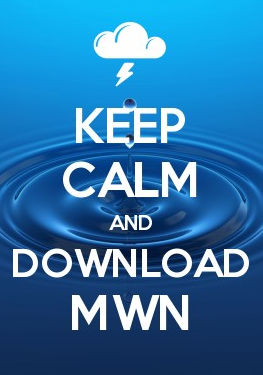 Visit the MWN Tropical page for the latest information. For the past day or so, we've been pushing out bits of information about Tropical Storm Isaac on our social feeds, however there is enough interest even in the Mid-South that it's time to cull the latest information and put it together in one place. So here it is. We encourage you to follow us on social media for the latest info as it happens - links can be found at the end of this blog. So far, Isaac wins the award for the largest mess of a tropical system I can recall. While nearly 1000 miles wide, it has so far remained highly disorganized, thanks in large part to a great deal of dry air that has been caught up in the northern half of the storm. Multiple times today, the National Hurricane Center and Hurricane Hunters flying into the storm have noted "multiple centers" to the storm - individual areas of low pressure within the cloud mass and convection (thunderstorms). If this storm can get organized (which we expect it to tomorrow), it could become a large one to reckon with. Obviously in forecasting, including for systems like these, meteorologists rely strongly on computer models to provide a clue as to what path a storm will take, how strong it will be, and how fast it will move. Then, intuition kicks in and adjustments are made to the forecast. I'll admit I am NOT a tropical forecaster and have not been specifically trained in hurricane meteorology. However, I can parse a great deal of incoming information and I follow many bright minds in the business for clues on a storm's structure and tendencies. While I don't claim to be able to forecast the track or intensity myself, I DO know a fair amount about what causes these storms to tick, what factors tend to strengthen and weaken them, as well as the potential impacts given a known set of parameters. First I introduce the current conditions. Below is a recent infrared satellite image as the storm moves generally west, to the south of Puerto Rico and the Dominican Republic. Maximum sustained wind is near 45 mph. The strongest convection (storms) is in the reds and dark grays, mainly southwest of the center. I expect we may see that center re-located somewhat if convection continues in that area as it seems the most likely place for the primary "center" of the storm to appear. Next, we look at the official track from the National Hurricane Center. It indicates a west-northwest motion across Haiti tomorrow, a northwest path over the mountainous terrain of Cuba on Saturday, then emerging over the southeast Gulf of Mexico Sunday afternoon. After a hit on the Florida Keys (with south Florida on the stronger east side of the storm), Isaac continues northwest across the Gulf towards the north-central Gulf Coast early next week. Isaac could briefly attain hurricane status before reaching Cuba, but will lose strength over the mountains this weekend if this path verifies. Once emerging over the Gulf, conditions are highly favorable for re-intensification, perhaps rapidly depending on how disorganized it becomes over Cuba. The less time it spends over land, the more likely it is to be stronger after emerging over water and begins strengthening again. Now we look at a series of computer model forecasts, commonly called "spaghetti plots" - you can probably see why they are called that. These potential tracks, as a group, have been shifting west with each new model run (which occur every 6 hours). First, the afternoon model runs, which show potential landfalls, as a group, between the Big Bend of FL and the MS Gulf Coast. Next we check out the latest evening models, which clearly show a more westward shift with potential landfalls from southeast Louisiana to near Pensacola. Computer model output for Thursday evening. Note a general westward "shift" in the potential tracks (as a whole). Finally, we look at another suite of forecast tracks, all from the same model (the well-known GFS) but with various possibilities this model considers. Again, the tracks cluster along the north-central Gulf Coast with landfalls ranging from Biloxi to Apalachicola (disregarding a couple of outliers). 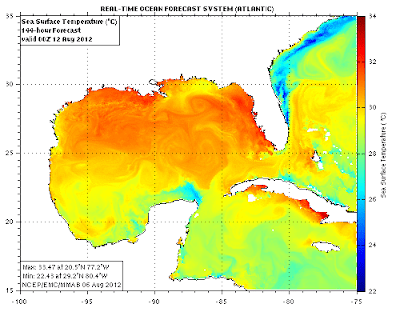 Lastly, let's look at one of the reasons why intensification is likely over the Gulf - water temperatures. Many parts of the Gulf are nearly bathwater temperature, which is like feeding an athlete Wheaties, then injecting steroids. The orange-red colors are temperatures of 86-90+ degrees. Any storm that passes over those waters will get a shot of high-octane fuel. So, what does all this mean? It means you should stay tuned. It means that the northern Gulf of Mexico needs to be on high alert for the possibility that we could see the first major (category 3 or stronger) U.S. landfall in nearly 7 years (the last was Wilma in the infamous year of 2005, which also produced Katrina). It also means that the entire east coast of Florida could be side-swiped, including Tampa - the site of the Republican National Convention next week. It also means that meteorologists will be closely monitoring the tracks and that it's conceivable the city of New Orleans could be tested for the first time since Katrina. Landfall, wherever it occurs, will likely be in the Tuesday-Wednesday time frame with the storm moving out of the Gulf Coast region about 24-36 hours after landfall. How about impacts on the Mid-South? It's really too early to tell. However, one thing we are sure of is this - the farther west the track goes in the Gulf, the more likely it is we could feel some impact. A landfall in Louisiana would give us a higher likelihood of rain than landfall in the Florida panhandle. I don't know anyone who wouldn't welcome some rain in the Mid-South after the drought of summer 2012! Stay with us for the latest via the MWN Tropical page on MemphisWeather.net as well as our Twitter and Facebook feeds linked below. The graphic below shows metro temperatures shortly after 8pm tonight and one thing stands out: it's hotter in the city than in the suburbs and outlying areas (by as much as 10-14 degrees)! This is known as the "urban heat island effect" and is typical in major cities. Heat buildup during the day dissipates much less quickly from cities than rural areas as buildings, asphalt/concrete, and "urbanization" in general releases heat more slowly than more rural areas where there tends to be more grass, trees, and other vegetation. Not only does it retain the heat longer, but the mere presence of man-made objects and surfaces will often keep those areas warmer throughout the night, thus having warmer low temperatures than the surrounding rural areas. Often, you'll see MemphisWeather.net provide a certain low temperature in our forecast, then also include a cooler low for "outlying areas" or the "suburbs." Now you know why! We understand the effects of the urban heat island, and now you do too! 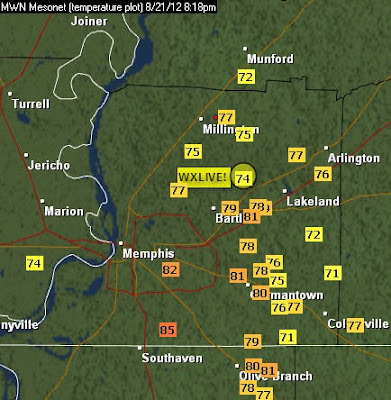 The urban heat island is easy to spot in these 8:15pm temps around the Memphis metro. While the airport and midtown and still in the 80s, temps are as much as 10-14 degrees cooler in outlying areas. The Dredge Hurley, owned by the U.S. Army Corps of Engineers. Photo courtesy USACE/Memphis District. Low water continues to cause trouble on the Mississippi River at Memphis. This morning's stage of -8.5 feet is a slight drop from yesterday. The forecast is for a continued slow drop to -9 feet by this weekend. River forecasts can be found on MemphisWeather.net here. The U.S. Army Corps of Engineers is using a 350-foot-long dredge to make the Mississippi River near Memphis easier for barges and boats to navigate. The Corps is using the dredge to remove sediment from the Mississippi River’s bottom as it tries to maintain the river’s vital navigation channel. The dredge, called the Hurley, is currently working at Redman Bar just north of Downtown Memphis. Engineers have been dredging sections of the river near Memphis because its low water level could pose a hazard to barges and tow boats that transport material down the river. Officials say the river is running several feet below normal. The Hurley can dredge to a depth of 75 feet and can remove up to 5,000 cubic yards of sediment per hour. 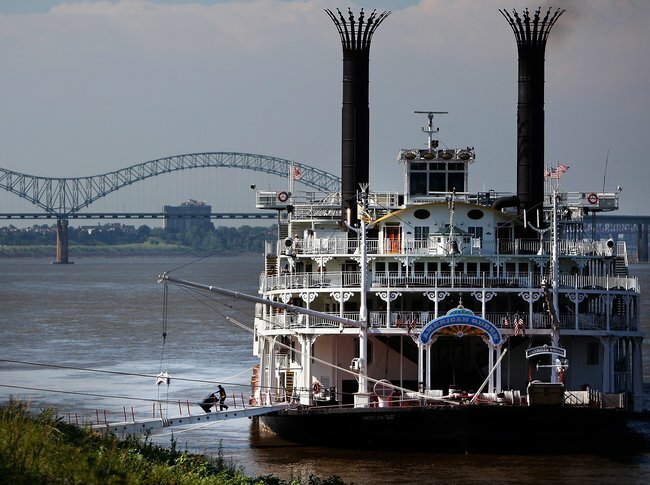 The American Queen docked on Mud Island in Memphis this month; its owners decided not to send the boat below Memphis on a trip to Vicksburg. Photo credit: Jim Weber/The Commercial Appeal. 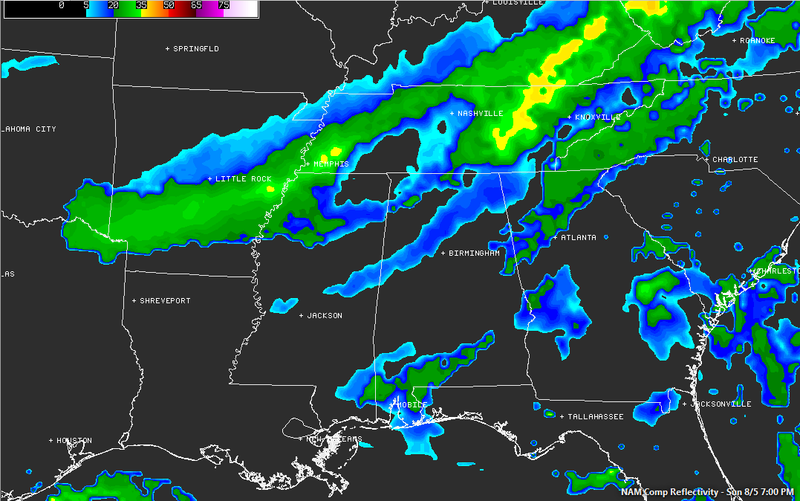 Rain in Arkansas - will it effect the Memphis metro tonight? A shortwave (or impulse of atmospheric energy) is rotating south around the backside of a large upper level trough over the eastern U.S. mentioned in yesterday's blog. This wave has combined with heating to force scattered thunderstorms and showers over western portions of the Mid-South and Ozark region. Below is the radar image from Little Rock taken about 4:15pm Sunday. The showers and storms are moving southeast, but only at about 15 mph (pretty slow for storms). If they held together and continued on their same track, a few could affect the Memphis metro area (right-center of the image). 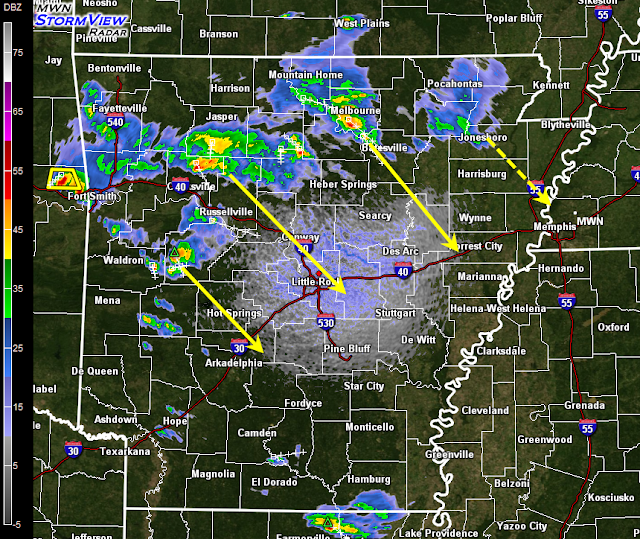 However the cells up around Jonesboro are weakening pretty quickly (hence the dashed arrow pointing at Memphis). And while new cells could form, it would take about 3-4 hours for this precipitation to make it to the metro. By then, the sun is setting - one of the key ingredients in the formation and maintenance of these showers and storms. Our metro forecast: increasing clouds the next couple of hours with a slight chance of rain, mainly in far western portions of the metro (along and west of the river in AR). Most folks will see little to nothing from this wave other than clouds. I think we'll have to be content with temps falling into the 70s after dark and low humidity, which should make for a pleasant evening! The rest of the week's forecast can be found on MWN here. The hot stagnant upper level pattern we experienced throughout the summer seems to have taken a backseat to a more progressive one, more typical of early fall. A progressive pattern features passages of ridges of high pressure and troughs of low pressure ever y few days that bring some variety to our weather. As you've noticed, we've had a couple of rounds of strong thunderstorms move through the area this past week with somewhat more pleasant days dominated by high pressure that is not as unrelenting as we experienced this summer. The forecast for the week ahead holds some of the same. In fact, with yesterday's cold frontal passage, we are now moving into a period where an upper level trough will have an effect on our weather pattern, meaning cooler temperatures, less humidity, but still some rain chances, mainly this weekend. This morning, a round of showers and thunderstorms is moving east through southern AR, throwing clouds over our area, as well as the possibility of some light showers, though most rain will remain to the south of the metro. Upper level (30,000') pattern Saturday morning featuring a massive trough in the east and large ridge in the west. Another impulse will bring yet another area of rain to the Mid-South tomorrow. This one could be a little further north than today's, so it appears we'll have slightly better rain chances on Sunday. Again, southern Arkansas and Mississippi will see the brunt of the rainfall, though the northern edge could be over the metro, bringing primarily light rain. If, like a couple of the models indicate, the rain area moves even further north, we could see off and on rain throughout Sunday. For now, we expect most of it to remain to our south however. Upper level pattern for Monday shows a sharper trough over the Mid-South and a ridge still dominating the west. By Monday, the trough deepens over the area, pushing any rain chances further south and we'll enter a period of mainly sunny skies and low humidity for the first half of the work week. BY Wednesday, the trough will move east and upper level ridging will move take it's place over the region. This will lead to a warm up, but still no major surface fronts that are expected to bring rain. In addition, humidity looks to remain tolerable through the end of the week. Highs will warm from the low-mid 80s to start the week to near 90 by week's end. Mornings should be particularly pleasant this week with lows near 60 in the suburbs (slightly warmer in the city), warming somewhat by late week. By Thursday, the upper level trough shifts east as ridging builds into the Plains and towards the Mid-South. So, once we get through clouds and some rain chances this weekend, the Mid-South should enjoy a fine weather week of below normal temperatures and abundant sunshine! Click here for the full forecast from MWN or get the forecast, and lots of other great Memphis weather info, anytime on our mobile apps for iPhone and Android devices (links below). After a gorgeous August weekend (what we term a "bonus weekend") with low humidity and below-normal temperatures, the atmosphere quickly re-energizes in advance of another cold front that will move through the Mid-South on Monday. Wind has shifted around to the south and dewpoints/humidity will increase overnight, setting the stage for possible severe weather in advance of the cold front. A SLIGHT RISK of severe weather exists mainly east of the Mississippi River for Monday, as shown below, and includes all of the metro area. The timing for possible severe storms is roughly from late morning through late afternoon. Primary risks are dangerous lightning, damaging wind, and large hail in storm clusters or line segments, though some supercell storms are also possible, which could spawn an isolated tornado, though we believe that risk to be relatively low. The one "fly in the ointment" for this event will be the possibility of showers and non-severe thunderstorms early in the morning, or roughly after 6am. If these form, which models indicate are possible, it could sap some of the energy required for strong thunderstorms later in the day. 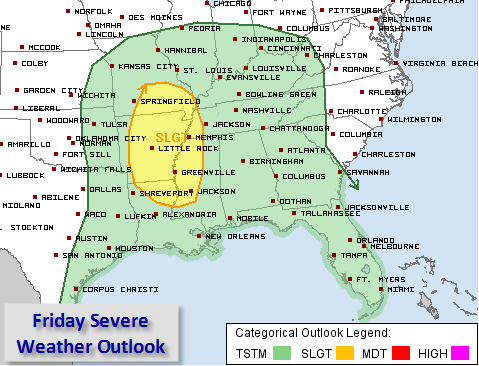 It's a trend that we will monitor and keep you advised on and the primary reason that more of Arkansas is not included in the slight risk zone. The timing of the front and associated ingredients that promote severe weather make it most likely east of the Mississippi River. As with the past few systems, not everyone will likely see rain, but those that do get thunder in the afternoon especially will need to be prepared for the possibility of strong wind and hail. MWN will provide complete nowcasting coverage of any strong to severe storms on our social media channels - Facebook and Twitter (links below). In addition, if you do not have StormWatch+ on your smartphone, it's time to check into it. You can add StormWatch+ to your MemphisWeather.net mobile app for less than the cost of a fast-casual meal and let it warn you of severe weather while you are away from other news and weather sources of information. It's personalized weather alerts in the palm of your hand! The metropolitan area remains entrenched in a severe to extreme drought this week. Below are comparison maps for the south-central U.S., as well as Tennessee, Mississippi, and Arkansas, for this week versus 4 weeks ago. While areas that were not under severe conditions showed some improvement over the past month, areas like the metro that need rain the most are slowly getting worse. South-central U.S. drought conditions have improved somewhat in the past 4 weeks, especially over east TX, the Gulf Coast, and middle and eastern TN. OK and AR have gotten much worse. Much of middle and eastern TN is no longer in a drought state, though extreme west TN has gotten worse. 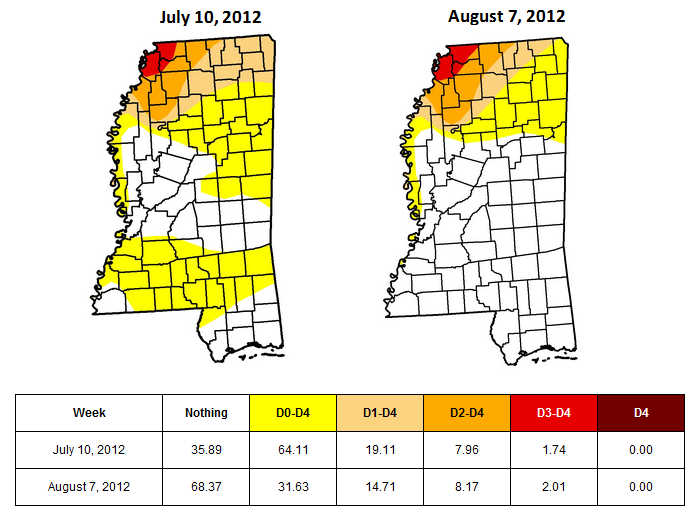 Shelby and Tipton County are now in an extreme drought. North MS is also extremely dry, with little change in the past months, while a minor drought over southern MS ended in the past month. 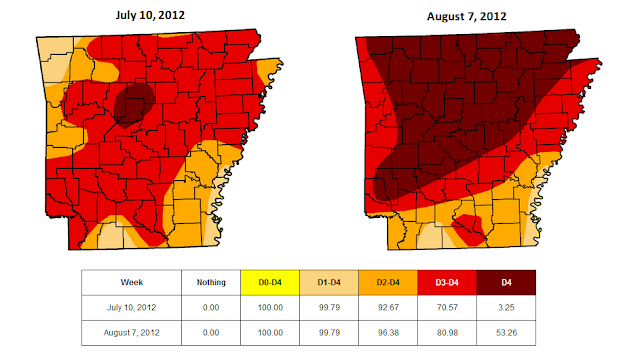 The state of AR is in dire straits with over 50% of the state under "exceptional drought" conditions. It takes a while to end drought conditions. Above is the amount of precipitation required from August-October to end the current drought. Not sure we'll see 20" of rain in 3 months, especially given the outlook below! With expectations for "near normal" precipitation in the Mid-South from August-October, it appears drought conditions will continue into autumn. Average precipitation for Memphis for these 3 months is 10". Early Friday front will bring storm chances, then fall-like weekend weather! The Mid-South was back in the heat this afternoon as temperatures soared to near the 100-degree mark. Fortunately, low humidity levels still in place following this past Sunday’s cold front helped to prevent conditions from becoming too oppressive. Now, a new cold front is on the approach from the northwest. Its arrival early Friday will bring about another chance of scattered thunderstorms, and then behind it the strongest push of cooler air the Mid-South has seen the entire summer! Clouds and humidity levels will be on the increase tonight and there may be a few showers as early as Thursday morning. However, better chances for rain and thunderstorms will hold off until the afternoon and early evening hours as the front moves towards the region and daytime heating increases instability levels. Similar to this past Sunday, not all of the metro is likely to receive rain. Instead, scattered activity is expected to be found on radar. Because of the expected high instability, some thunderstorms which develop would have the potential to become strong to severe, with damaging wind gusts the primary threat, and hail a lesser threat. 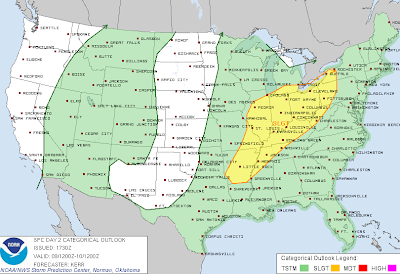 The Storm Prediction Center has outlined the entire metro area in a “Slight Risk” for severe weather Thursday. 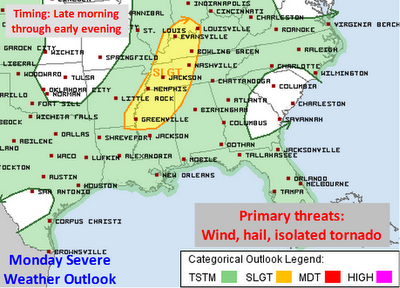 Storm Prediction Center severe weather outlook for Thursday. 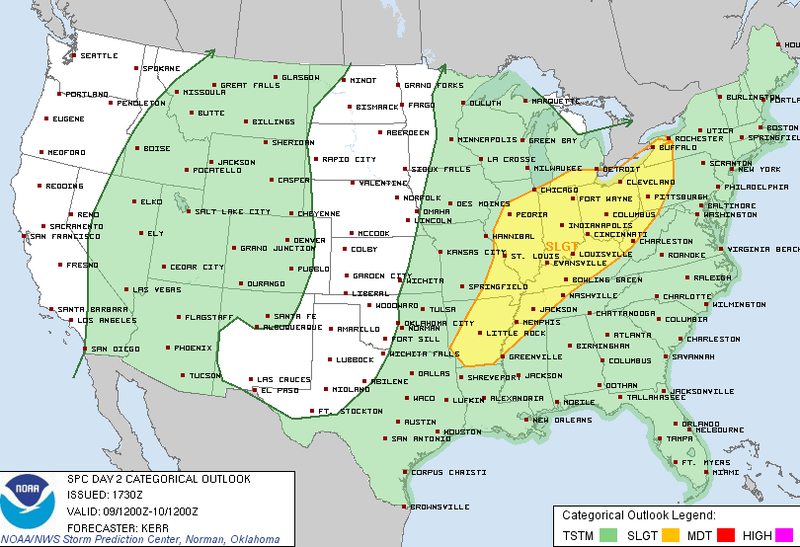 The metro is included in a "Slight Risk" area. The front will pass through the region during the early morning hours Friday, taking any leftover rain out of the region by Friday morning, and what follows will be a truly refreshing change in our weather pattern! Not only will humidity levels drop significantly, but temperatures will take a tumble as well. Saturday looks to be an incredible start to your weekend as highs struggle to reach the middle 80s under crystal clear, sunny skies. Cool overnights are also expected over the weekend, with mid 60s in the immediate Memphis area and even a few upper 50s possible in the coolest outlying areas! Temperatures will begin to rebound at the start of next week but humidity levels will likely stay reduced for several days. MemphisWeather.Net will keep you updated on our social media feeds (see links below) of any threat of thunderstorms and severe weather Thursday with extended nowcasting as necessary. Be sure to download the MemphisWeather.net apps for Android and iPhone to keep you updated with the latest information on possible severe weather. StormWatch+, our severe weather notification system for your smartphone, is available within the MWN app, and now as a standalone app! Welcome new MWN team members! As many of our followers and friends know, MemphisWeather.net (MWN) excels in providing precise and vital storm information via social media when inclement weather threatens or is ongoing. Called "nowcasting," MWN was (and still is) one of the only organizations in the nation to provide this service consistently on social media, namely Twitter and Facebook. We let you know where storms are, what threats they pose, when they will affect an area, and (sometimes most importantly to our followers) when they will be done. We relay all watches and warnings for the 8-county metro area and describe the exact threats storms pose in a way the general public (not fellow meteorologists) can understand. Nowcasting for the 4,000+ square mile metro area and it's 1.3 million residents would not be possible without the assistance of our nowcasters, social media student interns who volunteer their time to gain rich experience in Mid-South weather patterns, meteorological data interpretation, and social media communication - the new frontier in information dissemination. Over the past year, MWN nowcasting has risen to a new level with the assistance of nowcaster Kevin Terry (/KT on our social media posts). Kevin's diligence, quick grasp of new challenges, and weather knowledge obtained through independent study as well as a stint as an intern with the National Weather Service, have resulted in an exceptional, consistent, and thorough product on MWN's social media channels. 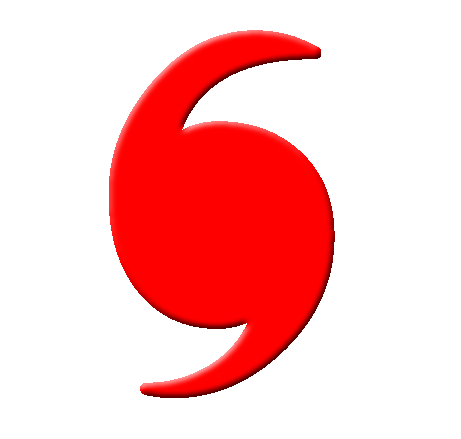 Kevin has also enhanced MWN's new #mSpotter Twitter-based storm spotting program, providing the National Weather Service with crucial ground-based information that has helped to verify severe weather warnings. Kevin will be departing MWN in mid-August to begin graduate studies in Meteorology at Mississippi State University. His shoes will be big ones to fill and we are grateful for his service over the past year! Heading into the fall, MWN is pleased to introduce you to two individuals who will take Kevin's place and serve as nowcasters on our team. Patrick Luckett (/PL) is an Earth Sciences major and senior at the University of Memphis and also holds an Associate Degree in Business Administration from Southwest TN Community College. Patrick has also served as an intern with the National Weather Service and brings experience in radar and forecast model interpretation and collecting storm damage reports at the NWS. He has "always loved weather" and has been a Weather Channel fan since a young age. It took until his junior year of college though to decide that his love would also be his career! Patrick will attend graduate school in Meteorology at Mississippi State beginning in fall 2013. Welcome to MWN, Patrick! Our other addition for this fall is Hunter Smith, also a senior Earth Sciences major at the University of Memphis. Hunter (/HS) has also had a fascination with weather from a young age, perhaps encouraged by a grandmother who takes detailed daily weather observations at her home in Brownsville, TN. Hunter also hails from Brownsville and, in addition to taking classes at U of M, works in the Sparks Bureau of Business and Economic Research on campus. Hunter, like Patrick, will attend Mississippi State University beginning in fall 2013, working towards a Master's in Meteorology. We also welcome Hunter to the MWN team! You will see plenty of posts by Patrick and Hunter on our social media streams over the coming months. Yet another well above average month temperature-wise as July finished as the 7th warmest on record despite a "cooler" spell mid-month. There were three daily temperature records tied during the month, including the 4th (100 degrees), 6th (102), and 1st (tied warmest minimum at 80 degrees). For the year, the average temperature in Memphis continues to be the warmest on record (and it's not even close). Through July 31st, the average temperature for 2012 of 67.2 degrees was 4.7 degrees above normal, beating the previous record though the end of July by more than 2 degrees (2006, +2.8 degrees). Precipitation was also well below normal with a total of 2.26" for the month and over half of that amount fell on the 21st! Drought conditions worsened during the month with the metro now classified as being in an extreme drought. The average temperature for the month of July was 85.3 degrees, or 2.6 degrees above normal. The average high temperature was 94.5 degrees and the average low was 76.2. The coolest temperature of the month was a balmy 73 degrees on the 13th and 29th, while the highest temperature was 103 degrees on the 5th. There were 24 days in which the high reached 90 degrees or higher and 7 days in which the high reached 100. Precipitation for the month totaled 2.26", which was 2.33" below average. There were 12 calendar days with measurable rainfall, but only 1 with more than 0.50" (1.21" on the 21st). The peak wind gust was 44 mph from the south on the 7th with an average wind speed for the month of 6.6 mph. Click here for a daily statistical recap for Memphis International Airport. The average July temperature at Cirrus Weather Solutions was 83.5 degrees with a maximum of 102.3 degrees on the 6th and a minimum of 64.7 degrees on the 29th (the only day the temperature dropped below 70). July precipitation measured 3.24" via the automated gauge and 3.32" in a manual gauge used for the CoCoRaHS program. The measured peak wind gust was 23 mph on the 6th. Average relative humidity was a muggy 73%. Click here for a daily recap on MemphisWeather.net. For the month of July, the average temperature error in all MWN temperature forecasts was 1.88 degrees, besting all available computer model data. Nearly 72% of the MWN temperature forecasts for the month were within 2 degrees of the actual temperature. MWN's forecasts extend out five periods (or 2.5 days). For dewpoint accuracy, the MWN forecast averaged 1.53 degrees of error and fell within 2 degrees of the actual dewpoint over 81% of the time. Historical accuracy statistics can be found here. A potent cold front is poised to move into the metro Sunday night. This front should have enough upper level support to move all the way through the area into central MS by Tuesday. That will mean a welcome change to our weather pattern - one that features less humid air and slightly cooler temperatures, especially in the mornings - for a good part of next week beginning on Tuesday. However, the front will be moving into an airmass that has featured very humid air, hot temperatures, and plenty of instability. That will mean a good chance that we'll see thunderstorms ahead of it, which will occur during the day and evening Sunday. In fact, there will be atmospheric factors in play that will provide the ingredients for the possibility of some severe storms on Sunday. As typical for severe storms in the summertime, the main threats will be from damaging wind and perhaps some large hail, in addition to dangerous lightning. Due to the abundance of moisture/humidity in place, some storms could also bring heavy rain in short periods of time. The one potential "fly in the ointment" tomorrow will be presented early, as some showers or thunderstorms could form in the morning hours. 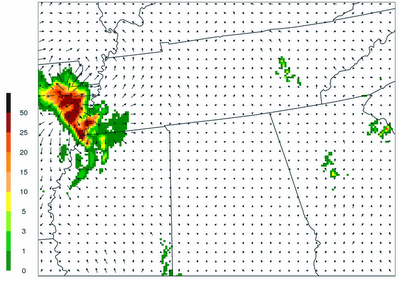 If this happens, it could sap some of the energy and instability needed to get severe weather later in the day. Overall MWN is expecting a chance of rain in the morning, probably after 9am, followed by a better chance (50%) of thunderstorms in the mid afternoon through evening hours (i.e., 3-9pm). We'll be monitoring things throughout the day and have nowcasting coverage on Facebook and Twitter (see links below) anytime severe weather is a possibility. It's also a good time for Mid-Southerners to pick up the MemphisWeather.net smartphone app for iPhone and Android devices. Once you download the app, be sure to add StormWatch+ severe weather alerts via the alerts interface in the app. The iPhone version has been recently upgraded and has added many user-customizable features. The Android app will be upgraded very soon, but still has the fastest available alerting for severe weather, via StormWatch+. Links to more information and downloads are listed below. The complete MWN forecast for the upcoming week can be found here. On Monday night, July 30, shortly after 10pm, a small but powerful storm moved through the eastern side of Olive Branch, MS, just southeast of Memphis. As it passed over the automated sensors at Olive Branch Airport, a wind gust of 65 mph was recorded. Initially written off (fully automated sensors are known to occasionally spew invalid readings), MemphisWeather.net nowcaster Kevin Terry decided to made a request for personal observations from people following MWN on social media in the Olive Branch area. And they came through! Providing comments like "the wind was so strong and carrying so much grit in it it felt like pins and needles were sticking in me" and "I had to push my body against it to get back inside," it became clear that the storm had produced more than ordinary gusts. Probing further, the following report was received regarding the estimated wind speed: "I say close to 50mph...it was enough to blow over my overfull (sic) trash can." Then on Tuesday morning, an MWN follower said, "we lost 2 trees last night. Quite a few trees down in the neighborhood." Reflectivity (precip - left) and velocity (wind - right) at 10:05pm on July 30, 2012. A thunderstorm producing damaging wind is depicted. Armed with reports of trees down and the other valuable information, we approached the NWS again about the 65 mph gust from the Olive Branch sensors. On re-examination of radar data from the NEXRAD in Millington, the NWS discovered that a microburst had descended from the storm on the east side of the town and happened to hit the official recording station for Olive Branch! The 65 mph wind gust was determined to be accurate based on the reports and radar data and an official storm report was filed by the NWS. MWN sincerely thanks all of you who provide feedback on what is happening in your area, particularly through our #mSpotter Twitter-spotting program. Your reports are immediately transferred to the Memphis NWS office and help corroborate warnings, improving the quality of the information the NWS disseminates to the general public. This is just one example (another is the Germantown flooding from a few weeks ago) in which the NWS was able to verify the presence of severe weather through your first-hand accounts! Keep it up and thanks so much! The Storm Prediction Center, issuer of convective watch boxes and outlooks, has placed northeast AR and western TN under a Slight Risk for severe weather tonight. The primary threat, besides dangerous lightning of course, will be damaging wind, with a slight chance of some hail as well. Tornadoes are not expected. Models do not all agree on the scenario for tonight, but a few indicate that storms will fire on a disturbance in Missouri left over from previous thunderstorms, then track south to southeast through the Mid-Mississippi River Valley towards the Mid-South. 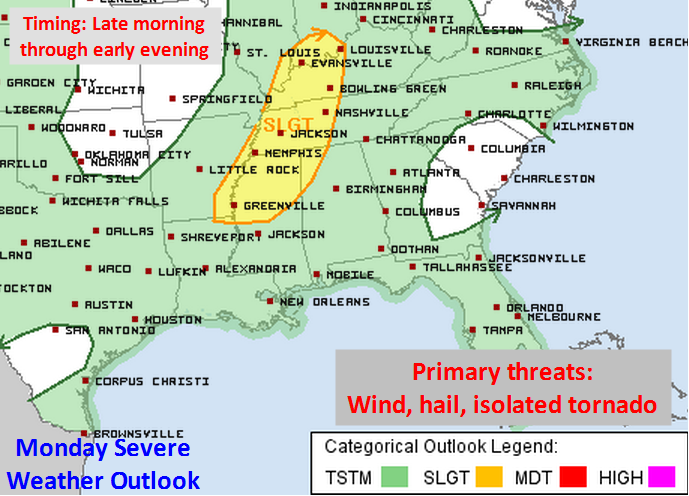 If this is the case, storms should be weakening as they approach the metro and SPC tends to agree given that the southern end of the Slight Risk zone is at the TN/MS border. Timing for any rain/storms will most likely be after dark (9-10 pm) through the very early hours of Friday should they occur. MWN will keep you updated with the latest info as it becomes available via our social media feeds listed below and will be nowcasting any storms that develop in the metro. Now is a good time to make sure you have the MemphisWeather.net app for your smartphone and have activated StormWatch+, which will wake you up if severe weather threatens your location! Download links and more information are also provided below.